You can’t touch it, but you know it’s there. Everyone knows what it is, but no one knows what it looks like. What is it? It’s the future, of course. One could think of the future as a most peculiar kind of public good. Theoretically, all of us have access to the future, without exclusion. At the same time, having my fair share of opportunities to be and do what I aspire to does not prevent you from having yours. Like water or air, futures can be of better or worse quality. On the one hand, this hinges on hard constraints, such as the abundance and sustainability of natural capital; on the other, the possibilities of a generation depend on the fair opportunities they get to shape them, which are in turn a matter of the robustness of social capital, the resilience of human capital and the quality and inclusiveness of institutional capital. In violent or divided societies the future is arguably more or less accessible depending on where you stand. The edges of the future as a public good are therefore “fuzzy and dynamic”. They result from a complex mix of more tangible and intangible inputs that are, at the same time, the output of how well we govern our future. This is why the future is more than a simple public good, but what Singaporean policy-maker Aaron Maniam calls a “generative commons”. Our investments, innovations and resource management today can shrink or stretch the scope of the future. The way we decide – the participation, transparency and trustworthiness of the democratic process – affects the quality of the social capital that will sustain the future. The initial condition in which a generation finds its future is unquestionably determined by the decisions of previous generations. This is why the governance of the future is fundamentally a question of intergenerational equity. Like forests or fisheries, the future needs to be protected from the human tendency to have it all today, without anticipating that tomorrow there may be no more for us and others. Indeed, for today’s younger generation – and the one that will follow – the future is becoming an ever a scarcer resource, an intergenerational tragedy of the commons. A group of teenagers in the United States filed a lawsuit claiming that the planet and its natural resources may have been “so profoundly damaged” that the “plaintiffs’ fundamental constitutional rights to life and liberty” are threatened. The science is, indeed, clear: at its current pace, climate change may irreversibly break the sustainable limits of our planet, leaving generations that are yet to be born to deal with shortage and displacement driven by natural disasters. The future is becoming a burden young people are indebted with, rather than a public good to inherit. This is true in Europe and the United States. Each of us would wish to receive from our parents at least “as much and as good” as they had, as philosopher John Locke put it already 300 years ago. In the past decade, households in 25 advanced economies that experienced falling or flat disposable income were 10 times more numerous than in the period between 1993 and 2005 . Today’s generation of twenty-somethings is likely to end up poorer than their parents . Not coincidentally, a survey conducted by Facebook in the United States found that, for most millennials, being successful in life mainly means being debt free . Traditionally, family welfare sustains young people in tough transition, because their work will eventually pay for their retirement. This social contract is broken: public transfers to the old seem to have surpassed private transfers to the young. European governments on average spend twice as much on pensions as on education . The current gerontocratic regime can make poverty an intergenerational legacy. Home ownership is the top driver of wealth in Europe, and a unique feature of the over 50s . For the “ rent generation ”, home ownership is a mirage. Fewer savings and a greater proportion of income going on rent mean fewer families are being started. When they are, more constrained modern families can raise the risk of childhood material deprivation : an obstacle to cognitive development, and an accurate predictor of how well adults will do in life in terms of employability, social mobility and even criminal records. As Europe prepares for a future in which 65 will be the new 55 and fewer workers will sustain our systems, gerontocracy promises to turn today’s pupils into tomorrow’s poor; it also makes the pensions of soon-to-be retirees less sustainable. The issue with future generations is that they have no seat at the table to claim and defend their rights. There are no trade or labour unions representing future workers, and organizations such as the Foundation for the Rights of Future Generations can by no means balance the influence of the organized interests of the present and the past. The consequences of such asymmetries are clear in the outcomes of the British referendum on EU membership and of the US’ presidential elections, where most young people stood in opposition to older people – and, once outvoted, accused their parents of depriving them of their future . The worrying implication is a decline in the faith that the youngest place in democracy and its institutions . Millennials, however, are not just victims of gerontocracy. They are to some extent responsible. The anti-future bias of our policies is insufficiently offset by the political entrepreneurship of today’s millennials. Meanwhile, voter participation of Europeans under 35 has consistently declined. Similarly, only 3 in every 10 young Europeans are committed to volunteering and civic activities. If the future ought to be governed like a public good, then responsive and responsible leadership cannot be just demanded; it must be participated in. Once we see the future as a public good to be stewarded rather than owned, we acquire the language and the tools to govern it so that fair access to opportunities is sustained across generations. Stewarding the future should not be a conflict of young versus old, but something in which everyone has a stake. Responsible and responsive leaders must master the skill of commons creation , which should be organized around three principles for policy action: resilience, sustainability and solidarity. Resilience is the ability of a person, a community or a system to thrive despite adversity. It is not simply the capacity of preserving certain qualities through shocks, but of positively adapting to transformations. It is the skill that turned homo sapiens from “animals of no significance” into those who govern the world . Sustaining progress calls for advancing people’s resilience. As the world is set to be transformed by the Fourth Industrial Revolution , bolstering the resilience of human capital by, for example, investing in skills promises, seems to be the best solution for a more inclusive future of work and for continued economic progress . Innovation will open up new chances to move upwards and more of us need to be ready to take these. 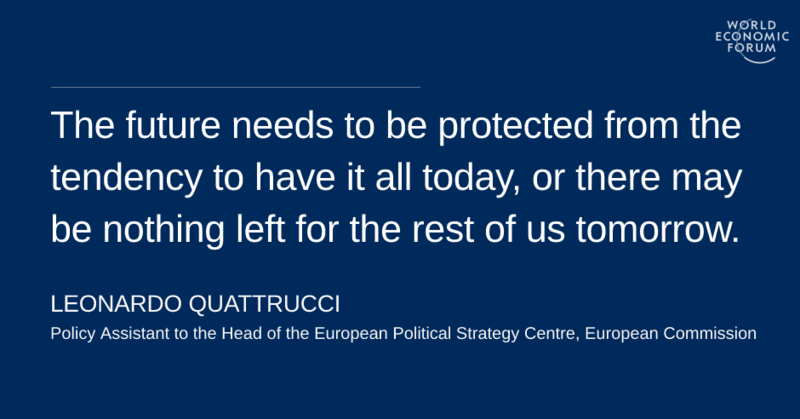 In the 21st century, resilience may well be the best form of social protection. The abundance of individuals’ future is, however, defined by that of economic, social and environmental capital. In other words, by the sustainability of our systems. There is yet a fourth, institutional dimension to sustainability, which may be the key to securing the other three. Inscribing in constitutions a principle of intergenerational equity – of sustainably administering the future as a common good – may be the best antidote to human short-termism. France and Switzerland have already done it, while Sweden has created a Ministry of the Future. Shouldn't others follow? The same principles would then be reflected in national budgets, to guarantee that commitments to sustainability in the now universal framework of the United Nations 2030 Agenda are enshrined even when governments change. In this context – and in line with the pursuit of resilience – accruing human capital would be best seen as an investment, rather than an expenditure. In the same way as we invest in street lighting and defence to enable our advancement and protect our well-being, we should legally oversee a sustainable use of the future as a commons. Public – and private – institutions should nudge themselves to govern by anticipation. Finally, since the future is a public good that no one should be excluded from, solidarity should be the principle underpinning its welfare policies. A World Bank study finds that most European countries could preserve the current average pension as a percentage of the average wage if the duration of retirement was set at an average of 15 years. 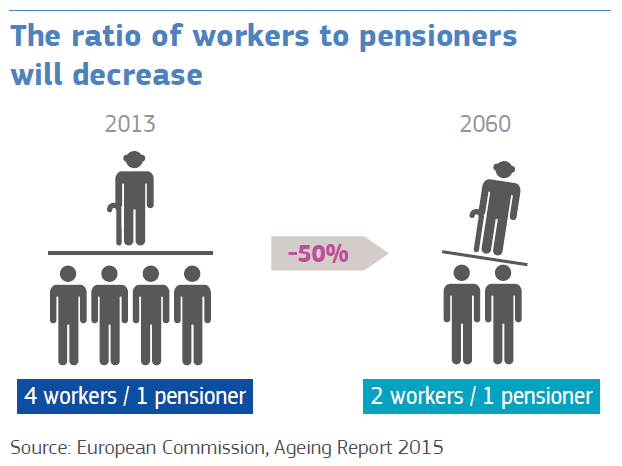 At the same time, about a quarter of the European Union’s population has reached retirement age, while in countries like Italy 40% of young people are unemployed. Solidarity should also mean that our elderly is invited to enrol in mentoring, volunteering or training activities to help the next generation get a fairer shot at life. Giving back also means giving forward. As mentioned previously, the quality of childhood determines lifetime chances and the ability of the future workforce to pay pensions. This is why spending on early childhood education is proven to be the most profitable investment in a nation’s prosperity. Mothers whose children are enrolled in preschool are also more likely to be employed in more skilled and better paying jobs. In turn, this means greater access to better opportunities for children, who will enjoy higher social mobility. As “skill begets skill”, society gets more resilient and subsequent investments in human capital get more productive. Clearly, early childhood education is a sure bet on a smarter, fairer, wealthier – even healthier – and more productive society. Humanity seems to have never been better off than today – on average. As human beings, however, we too often take bad decisions in good times. We realize it when it is too late, especially when goods are commonly accessible. This is how extinct animal species fell victim of the tragedy of the commons. The future risks being no exception – especially that of the younger and upcoming generations. We should govern the future as a public good, before it becomes too scarce a resource. Luckily, the future is a special kind of generative commons that we are still in time to shape. Its faith – and with it that of current and future generations – will not be the fruit of our intentions, but of our actions. Resilience, sustainability and solidarity should be the guiding principles of the governance of the future. We should enshrine them in institutions to nudge them to govern by anticipation, and with intergenerational equity. This is how the future will no longer happen to us by chance. This is how the future will be a public good we cultivate by choice. This is how the more we give forward, the more we will get back.